Although there are a variety of exercise variations to choose from, resistance training should be your number one choice. Resistance training is the mode of training that will reshape your body, getting you firm, fit, and healthy. It can take many different forms including lifting dumbbells or barbells or using weight machines at the gym. Using resistance tubing bands, or performing basic body-weight activities is resistance training. As long as you are forcing your body to work against some form of external resistance, you are resistance training. This said, resistance training with dumbbells or barbells (free weight training) does tend to yield the best results. You’ll have the highest possible external load and you’ll be working your core muscles to a larger degree as well. Increased muscle and bone strength: Challenging your muscles beyond their normal stress load with follow up rest and recovery creates strong muscles and bones. Your bones benefit and grow stronger and denser than before reducing chances of incurring a stress fracture down the road. Accelerated Resting Metabolic Rate: It will significantly boost your metabolic rate for hours after the workout is completed. This is perhaps the primary reason why you should be doing this mode of training more often. After a good strength training workout session, you’ll be burning calories for up to 48 hours, meaning you’ll be torching body fat all day long. This means less work on your end with your diet and cardio training. If you are able to build more lean muscle mass with your strength training workouts, it means you will actually experience a permanent increase in your resting metabolic rate since you have more total lean mass to support. Muscle tissue is very metabolically active, the more of it you have the more calories you burn doing nothing at all. This is one reason why men don’t seem to gain fat as easily as women. They have more muscle on their body – they have a protective element working for them. You too can get this protective element if you focus on building lean muscle mass. Women will never build as much muscle as their male counterpart will. However, they can definitely build muscle moving them in the right direction. Improved Functional Fitness Level: Resistance training that also helps to improve your functional fitness level. Assuming you are using the right workout program, you’ll be stronger than you were before and see immediate benefits in your everyday life so. 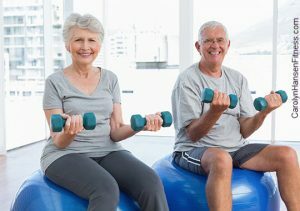 Daily tasks—walking upstairs, carrying groceries into the house, doing anything that involves muscular strength, will now be easier because you have strengthened the muscles involved in performing all of those movement patterns. Of course, if you don’t form your workout properly, it won’t be very functional at all and may not experience any benefits. Improved Muscle Tone and Development: No better way to contour your body than strength training/resistance training The primary reason many people get involved with a strength training program in the first place—is to see improved body composition and appearance. If you perform the right combination of exercises, you can add more curves to selected regions of your body, capturing whatever look it is that you desire. For instance, want a curvier backside? No problem. With the right exercises this is more than possible. Wish that you could tone that underarm flab that’s been with you since as long as you can remember? Strength training can help remedy that as well. Of course keep in mind that in order to see the muscle tone and definition that you’re building with your exercise training you will also need to be eating right so that you can achieve optimal fat loss in the process as well. If you aren’t eating right, you won’t be able to burn off that fat covering the muscle; hence definition will not be seen. With cardio training, you become a smaller version of your current self. With resistance training, you become a brand new you. Which do you want? Improved Self-Confidence: As you start making positive changes to your appearance, your self-confidence automatically goes up. This is normal and natural and for most people makes sense. The better you feel your body looks and the happier you are with your appearance; the more self-confidence you’ll have. This said, the positive appearance you’re building isn’t the only place where your self-confidence is will get a boost. When you realize just how strong you’re becoming and realize you are reaching the workout goals you set for yourself you’ll notice you’re becoming more self-confident too. Now, your body takes on a new meaning, a new perspective. You no longer view your thighs as “thick and flabby.” You have a new perspective. You see them for how they can help you achieve. Maybe you can squat 100 pounds and feel very proud of that fact. Or, maybe they helped you climb partway up a mountain on your last hiking trip. Whatever the case, your body now is more than something that you view for appearance’s sake only. It’s now something that serves a purpose. Something you know can perform various feats that you put your mind to. This is incredibly empowering and helps build a healthy relationship overall with your body. Lower Stress Levels: Finally, the last big benefit that resistance training has to offer is a much lower level of stress as well. Stress is something that you must take control over in your life. It can really come back to impact you in many negative ways if you aren’t careful. Stress cannot be avoided. It is a fact of life. However, the right strategies such as resistance training can help reduce and deal with it. When you perform intense exercise, you’ll be releasing a number of endorphins into your body. Endorphins are your “feel good” hormone. When released they give you a rush of energy causing you to feel good. You’ll feel more calm, collected, and relaxed. This “feel good sensation” is your own personal euphoric moment. Truth is, resistance training is one of the healthier ways that you can take out some of your built up anger and frustration. Especially useful for those who like to use force to release pent up stress! Sort of like punching a whole in the wall, but not destructive! If you can only do one type of exercise variation, resistance training should be your number one choice.